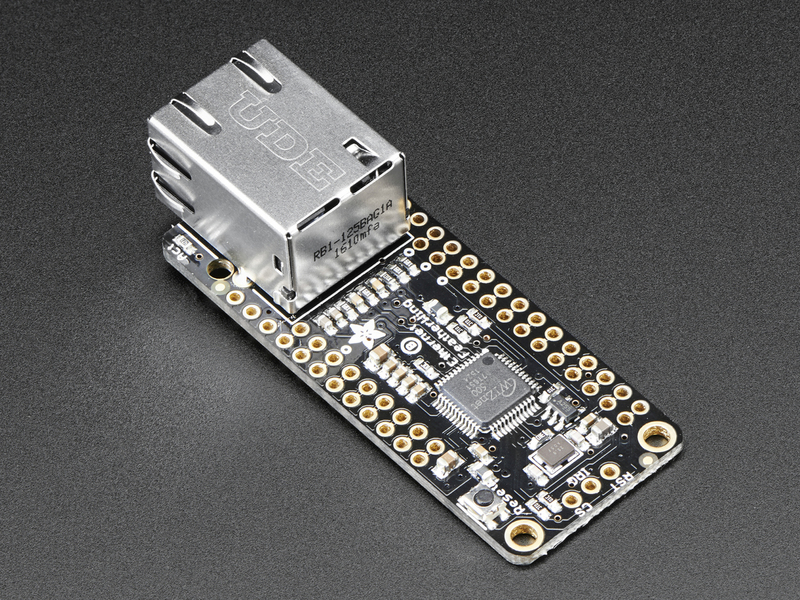 The Adafruit Ethernet FeatherWing is the perfect option for permanent installations using a reliable wired internet connections. What we like most about the Ethernet FeatherWing is that it works with the entire Feather board series and can be simply managed to run a number of different applications with high data rates using an ethernet connection. Click to learn more about the Ethernet FeatherWing from Adafruit's official page. In the following tutorial, Ubidots will demonstrate how to setup and program the Adafruit Ethernet FeatherWing using the Arduino IDE to visualize and interpret data using Ubidots IoT Application Platfrom. The Adafruit Ethernet FeatherWing can be used with any Feather Board, and the sample code provided below was designed openly to fit the series, so choose your Feather hardware freely. Looking for the Feather HUZZAH ESP8266 with the Arduino IDE setup? Reference to this guide to get you to the right place. 1. Go to the Adafruit library repository to download the Ethernet2 library. To download the library, click the green button called "Clone or download" and select "Download ZIP". 2. Now back in the Arduino IDE, click on Sketch -> Include Library -> Add .ZIP Library and select the .ZIP file of Ethernet2-master and then “Accept” or “Choose”. Once the library is successfully you will receive the message "Library added to your libraries". 1. Plug in the Ethernet FeatherWing into the Feather board. 2. Connect one end of the Ethernet cable to the Ethernet FeatherWing and the other to your hub, router, or switch. With the following sample code, we will POST ANALOG readings taken from the A0 pin of the Feather board to Ubidots for data enablement. 1. To post your first value to Ubidots, open the Arduino IDE and paste the sample code below. Once you've pasted the code, you will need to assign your individual, unique Ubidots TOKEN for authentication. /* Enter a MAC address for your controller below. /* if there's incoming data from the net connection. /* close any connection before send a new request. 2. Next, Verify your code within the Arduino IDE. To do this, in the top left corner of our Arduino IDE you will see the "Check Mark" icon, press it to verify your code. 3. Then, Upload the code into your Feather board. To do this, choose the "right-arrow"icon beside the check mark icon. 4. To verify the connectivity of the hardware with the internet, open the serial monitor by selecting the "magnifying glass" icon in the top right corner of our Arduino IDE to see the connectivity logs. 5. Confirm your data in Ubidots. Now you should see the posted data in your Ubidots account, locate the device called "feather-ethernet" and visualize your data. Now its time to create Ubidots Dashboards to visualize your data and deploy your internet connected monitoring solution!